← Gulf Coast MakerCon Welcomes Florida High Tech Corridor as 2016 Sponsor! Gulf Coast MakerCon 2016 Program Now Online! Our 2016 Gulf Coast MakerCon event program is now available for your browsing – and downloading – pleasure! 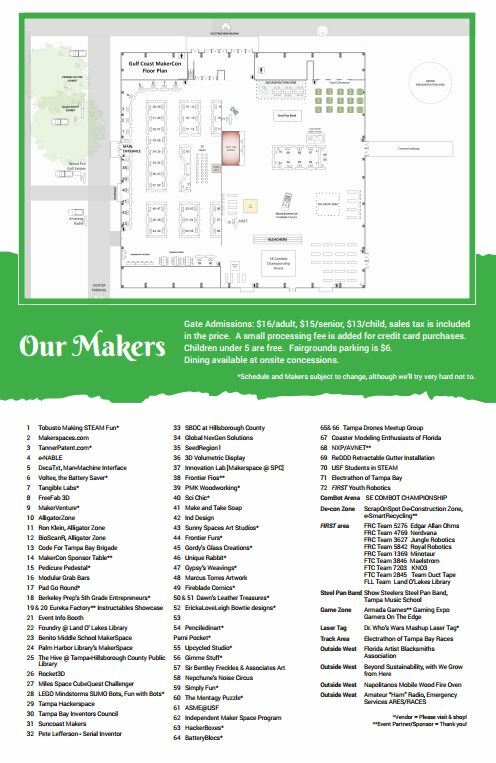 See the event layout, and check out our great list of exhibitors by booth number in the program or in this separate MakerCon Exhibitor Directory. Plus ongoing activities at Makespace booths, Heritage Crafters like the Florida Artist Blacksmiths Association, Amateur Radio exhibit and much more. 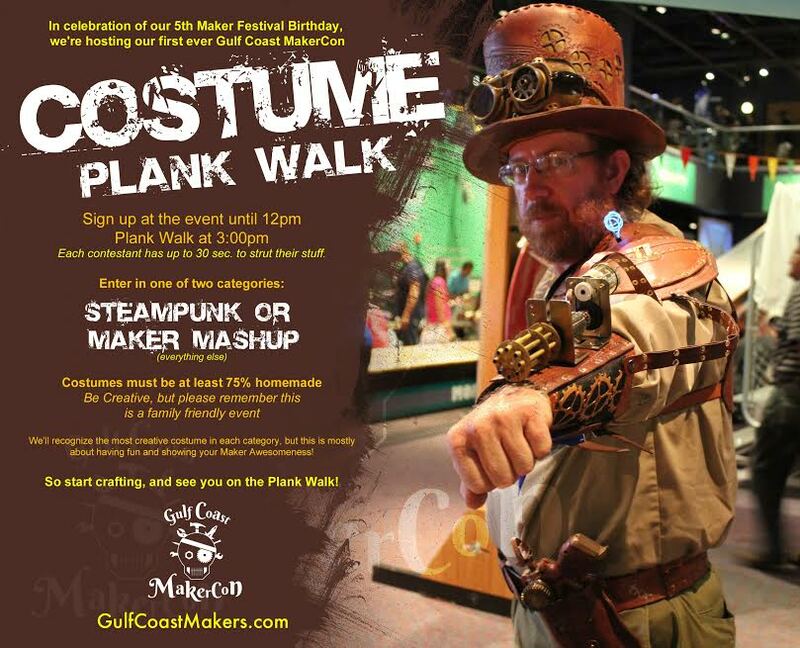 And don’t forget our inaugural Gulf Coast MakerCon Costume Plank Walk, inviting everyone to get their Make on with their most creative costuming! We have two categories: Steampunk and Maker Mashup (everything else!). Register by noon at the event, at the designated table, and get ready to strut your stuff at 3pm by the stage area. So look over the program and directory, and plan out your day to make the most of the 5th Annual Gulf Coast MakerCon Celebration of the DIY Inventive Spirit! Many thanks to Mity Mo Creative for making our event program look fantastic, and to Sonic Print for their very generous in-kind support with programs and event signage! Gulf Coast MakerCon wouldn’t be possible without the community minded support of the great individuals and companies that believe in the power and worth of our Gulf Coast Maker Community. Please consider them for your website design and printing needs year round! This entry was posted in Contests, Cosplay, Costuming, DIY, Drones, Gaming, Gulf Coast MakerCon, Gulf Coast Makers Festival, Handcraft, Heritage, inventors, jewelry, MakerCon, Makers, Makers Festival, Makerspace, Robotics, steampunk, Upcycling, Young Makers and tagged 3D printing, cosplay, Deconstruction Zone, Electrathon, Gulf Coast MakerCon, Gulf Coast MakerCon program, Gulf Coast Makers Festival, inventors, MakerCon, makers festival, Young Makers. Bookmark the permalink.